I got another Glossybox toward the end of May! 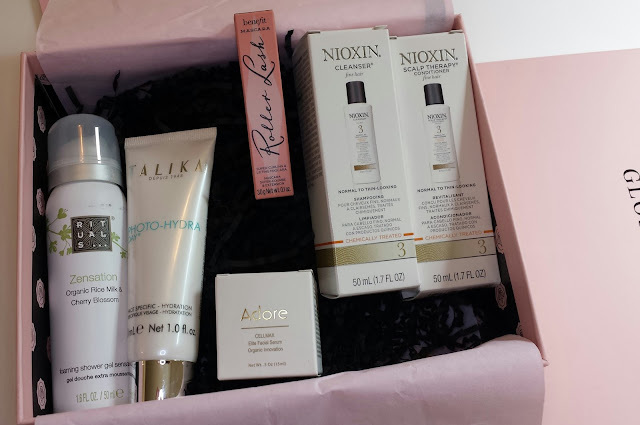 I am still thoroughly enjoying Glossybox, but as you will see, I did give away some of the items in this box. Rituals Cosmetics Zensation Organic Rice Milk & Cherry Blossom Foaming Shower Gel - Shower gel isn't something that I give much thought, but this is a really nice shower gel! It makes me think of shave gel in the way that it foams up, but I feel really clean when I use it. The soft cherry blossom scent is really nice, too. Talika Photo-Hydra Day - This is a daytime moisturizer that claims to "use energy from light to intensely moisturize the skin." It sounds like a really interesting concept, but this isn't for me. I need my daytime moisturizer to have a decent amount of spf, and this one doesn't have any. I did use this one evening, and it didn't feel like anything special on my skin. It was night, so I didn't go out in the sun and cannot tell you if that makes a difference at all. I know that I'm not going to use this, so I would like to pass this along to one of you! This is a full size product, and I've only used it one time. Just email your address to me, and you can have it. That's it. You don't have to send me anything in return or do anything else. Email me at willsingformakeup@gmail.com! I will edit this when I have someone that wants it. Adore Cosmetics Cellmax Elite Facial Serum - Another product that just isn't for me. The first time I tried this serum, I had to wash it off because it felt so heavy on my skin. Mineral oil and silicones are listed in the ingredients, and I can really feel them! I wanted to give this a shot because a full size costs $750, but I think we can all agree that more expensive does not always mean better! I went to see my parents last week and gave this to my mom. Benefit Roller Lash Mascara - I am thrilled to have a sample of this mascara! I've heard a lot about it, but I haven't purchased one for myself. There are so many open mascaras in my stash right now, so I haven't used it yet. I will not be giving this one away. Nioxin System 3 Cleanser and Scalp Therapy Conditioner - Nioxin products are for thinning hair and are really effective. I gave these samples to my aunt. She has only tried them once, but she said that she did think that it gave her more volume to her hair. Nioxin used to make a dandruff shampoo that I used for years until they discontinued it. It was the only product that I could find at the time that made my scalp feel clean. If you're having issues with thinning hair, then take a look at what Nioxin has to offer. They have a few different systems that might be able to help you. It may seem like this month's box is a bit of a dud given the number of products I've given away, but I really like this box anyway. There were products that somebody else would want and use, even if I didn't. I would consider the box to be a complete failure if it had a bunch of products that I couldn't even give away. As a blogger, I have more than one person could ever use, so I don't want to keep things that I just going to take up space. I'm sure many of you understand that! Do you pass along beauty products? Is there anything that you've given away that ended up being the other person's favorite product? I'd love to hear your thoughts! Some links are affiliate links. - Thank you if you use them!